With the introduction of playlist folders earlier in the week, Spotify finally gave us the missing piece in the puzzle of music management. There’s now not really any need for 3rd-party solutions or hacks to manage your Spotify music collection: you can now do it all right from within Spotify! The other area where Spotify had been lacking was an easy way to discover new music. I’ve blogged about this several times in the past, most recently a couple of months ago when a service called SpNotify came online. SpNotify is a notification service that updates you on your favourite artists and songs on Spotify. It’s still a fantastic site, but requires a bit of effort to make the most of (you have to manually enter every band you want to be notified about). 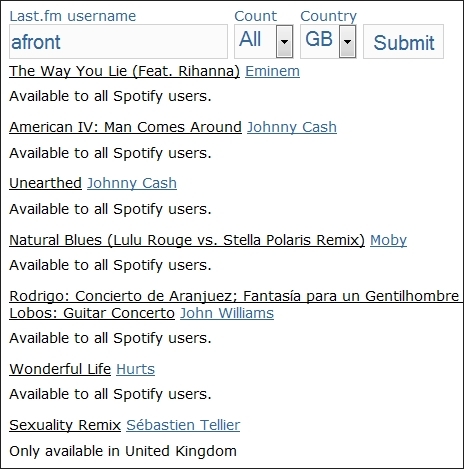 Now a new site called Spofm has arrived and I think it’s the webapp I’ve been waiting for: by combining What’s New on Spotify with your Last.fm listening habits, Spofm has finally solved the problem of keeping track of relevant new releases. You can click either an album name or artist to open the new release in Spotify: brilliant! The app is slick and fast and has instantly become one of my favourite Spotify sites. It may miss a few new releases, but this is due to the limitations of Spotify’s feed and not really anything Spofm has control over. Developer Martin has already improved Spofm based on user feedback, so click the Contact link on the page if you’ve any suggestions for improvement. One thing Martin is thinking about adding is an RSS feed, for example. In future it’d be great to base the recommendations on Spotify’s own stats on your listening habits (the Top Lists > For Me data), thus removing the need for a Last.fm account. But until Spotify make this information available from the API that’s not gonna happen. For now then, Spofm is one of the best personalized Spotify new release recommendation services around.